Although we have a pretty respectable collection of excellent cookbooks (unreasonable is far more accurate! ), there aren’t that many which we’d label as essential. 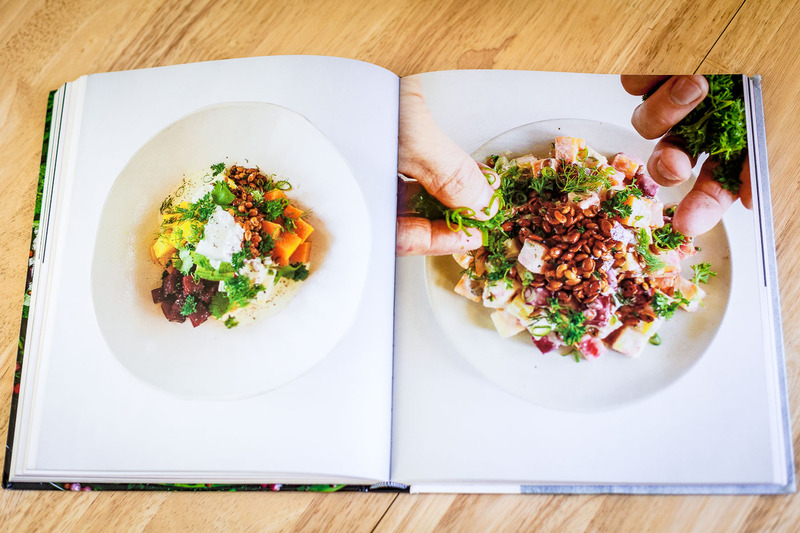 And sometimes, we discover a truly unique cookbook that brings us so far out of our culinary comfort zone that it changes the way we think about food. Bar Tartine is one of those books. The first thing it does, is to guide you deep south into the unknown territories of DIY (do it yourself) food. Sure, we’ve all done a mayonnaise, chilli jam, or a dill pickle at some point – but this pushes the edge of homemade food beyond what you can imagine. 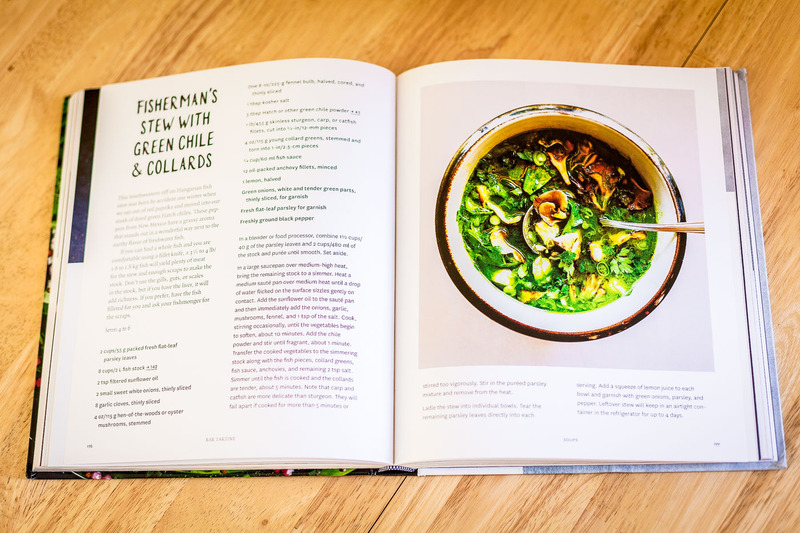 Even though you might be an experienced pickler, a healthy food veteran, or a canning virtuoso – we can promise you that this book will feel like no other. Tartine is so “real”! The spirit of the place, their attitude towards food and their passion to try new things is absolutely contagious and you’ll be hard pressed to find these recipes anywhere else. After the first few pages you’ll find quickly yourself in a strange and beautiful world of flavours and textures that you’ve never experienced or even thought about. This is the closest we’ve got to Willy Wonka’s kitchen as homemade kimchi or a garlic-lemon dip feels so “basic” after this. But do fasten your seatbelt, the ride is certainly not for the faint of heart! 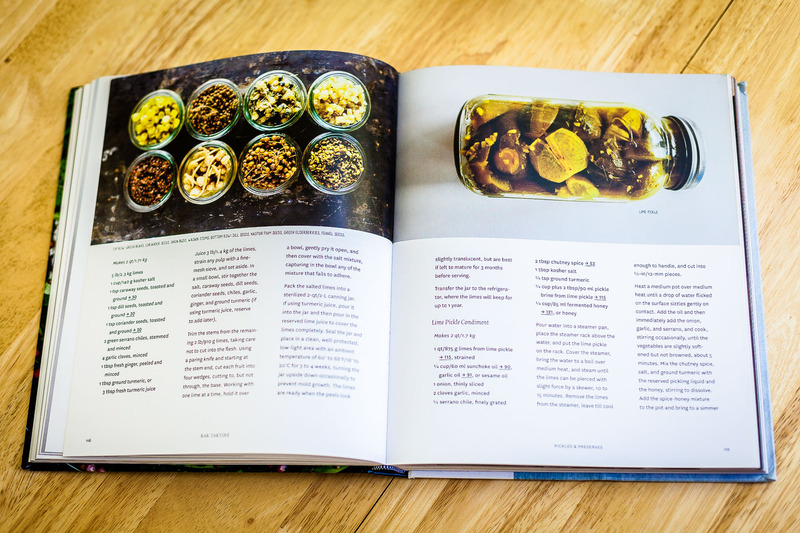 The first half of the book covers what we could call “the pantry” – how to make from scratch pretty much any basic ingredient you can think of, from fancy algae or vegetable powders, fermented honey, kefir, spice pastes, and so on. Crazy things, but certainly delicious! Nothing is sacred here so be prepared to seriously challenge your perceptions of what a salad or soup is supposed to be. Sweet, salty, sour, crunch, soft, acid, spice is everywhere. Strong flavours and ingredients such as healthy amounts of choucroute, duck fat, and herbs will be waiting around each corner. Most pantry ingredients are quite simple to make, but oh my, so diverse, so interesting, so inspiring! The second part is the recipes, a serious pack of delicious-looking and exotic-sounding dishes you didn’t know existed, but certainly will want to devour. Yes, each dish has a photo, and the plating is on par with what top restaurants have on offer. 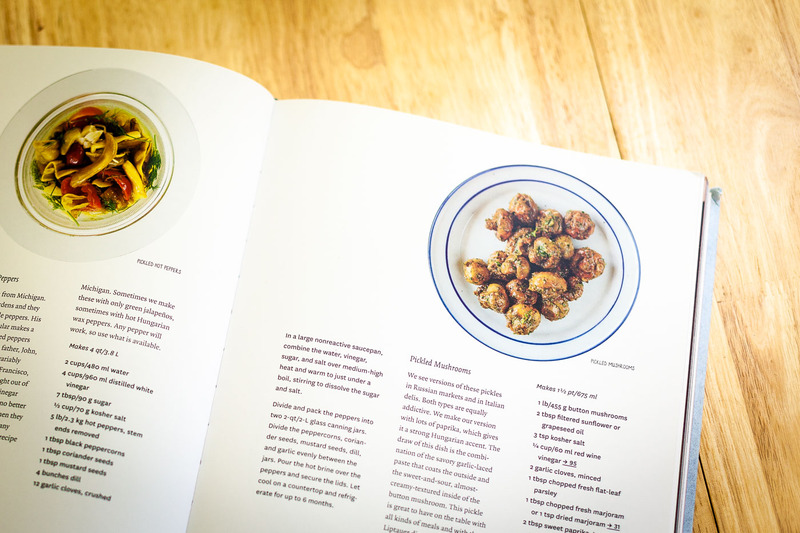 True, this is not an easy book where you’ll find quick 15-minute dinners, but this is exactly what makes it so special. Many recipes require several of the preparations from the pantry section, so you’ll need to dedicate time and patience to make them. But if you’re willing to try it, your efforts will be rewarded with tons “oooh” and “whoaa” from all guests at your table. 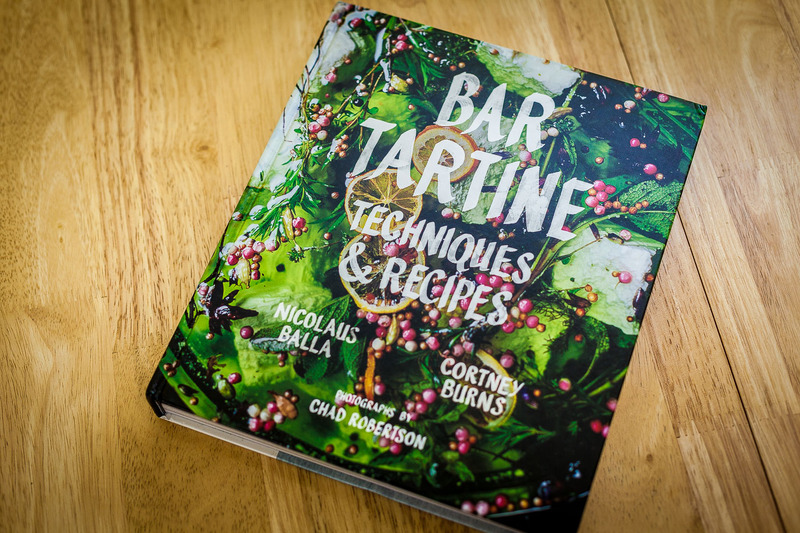 Bottom line, Bar Tartine is a remarkable and incredibly sound cookbook. Not the smoothest introduction to home-made food, but surely the one that will take you the furthest. One thing is sure, this is what we hope the food of the future will be like. We tried a funky recipe, the Chilled Apricot Soup with Fennel & Noyaux, nice, refreshing and totally experimental! Cut the apricots in half (save the pits for noyaux). Chop 1 fennel bulb for the soup base. Slice the other bulb into thin half-moons using a mandoline or a sharp knife and put it aside for garnish. Heat a medium saucepan over medium heat. Add the oil together with the onion and chopped fennel and cook, stirring occasionally, until the vegetables are slightly soften (about 5 minutes). Add the wine and dashi and bring to a simmer. Then add the dried apricots and simmer until tender (about 5 to 7 minutes). Remove the dried apricots from the liquid and reserve for garnish. Continue to simmer the liquid until it is reduced to half (about 30 minutes). Add the halved apricots, bring back to simmer, and cook for about 10 minutes. Remove from the heat and let it cool slightly. Transfer the mixture to a blender, adding the honey, ground fennel seeds, and 1-2 tbsp salt. Purée until smooth. Pass the mixture through a mesh sieve and refrigerate uncovered until well chilled (about 4 hours). In a bowl combine the reserved fennel with lemon juice and a pinch of salt and toss to mix. Serve the soup in a chilled bowl, adding a scoop of yogurt. Garnish with the sliced fennel, fennel oil, reserved apricots, pepper and noyaux (almonds).